All GOLDEN CHIEF leather welding apparel has been made using carefully selected GOLDEN CHIEF Leather to suit the professional welder looking for lightweight welding apparel that looks great but still provides high levels of protection. All GOLDEN CHIEF leather welding apparel seams are lock stitched and sewn with DuPont KEVLAR thread for extra durability and strength. Where necessary heavy wear seams are welted for additional durability. The GOLDEN CHIEF® premium leather welders bolero jacket with apron is made from selected GOLDEN CHIEF® leather. The jacket has a lined collar, sleeve pen pocket, adjustable press stud wrist closure and full press stud front closure. All seams are sewn with heat resistant Kevlar® thread. 730mm Long. The GOLDEN CHIEF® premium leather welders jacket is made from selected GOLDEN CHIEF® leather. The jacket has an inside breast pocket, lined collar, sleeve pen pocket, adjustable press stud wrist closure, full press stud front closure and side adjusters. All seams are sewn with heat resistant Kevlar® thread. 730mm Long. The GOLDEN CHIEF® premium leather welders sleeves are made from selected GOLDEN CHIEF® leather. The sleeves have adjustable webbing straps and all seams are sewn with heat resistant Kevlar® thread. 730mm Long. 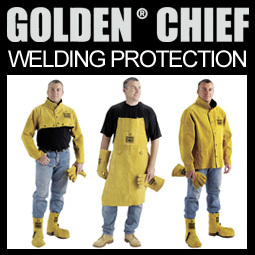 The GOLDEN CHIEF® premium leather welding apron is made from selected GOLDEN CHIEF® leather. The apron features a front pocket, webbing straps and quick release buckles, two front D-rings for gear attachment and reinforced wear areas. All seams are sewn with heat resistant Kevlar® thread. 730mm Long. The GOLDEN CHIEF® premium leather welders spat is made from selected GOLDEN CHIEF® leather. The spat has a Velcro® closure with strap and buckle under the boot. 609mm long. All seams are sewn with heat resistant Kevlar® thread. 730mm Long.